For the last week, I've really been looking forward to today. We've scheduled a ride with friends today. I've been working out of town (out of state, actually) and had no chance to ride Katie Scarlet for over a week now. So frustrating, but from time to time, work comes first. I'm excited to ride today, but as usual, as soon as I thought about it, my palms began to sweat and the fear of failure clenched in my gut. Pushing past this gets easier every time, but I'm looking forward to the day when I don't get this feeling anymore. We attended a charity event for our home town Menifee last night. 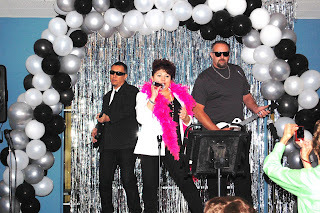 It was a "Celebrity Karaoke" contest to raise money for our local food pantry the Menifee Valley Community Cupboard. I'm deeply devoted to the Cupboard, as they helped me years ago when my then-husband was out of work. He had been unemployed for 1 1/2 years, and we had hit rock bottom, having no money, no credit and no food. Their annual fundraiser has local "celebrities", such as the Mayor, City Council members, business owners, perform Karaoke and compete for prizes. I performed last year (with Highway and my nephew David) and we had a blast! This year I sang with my girlfriend and midway through our performance, I tripped onstage. Down I fell on my hip, tried to get up, and my weak knee gave out, dropping back down onstage again. I laughed through the whole thing, but I'm glad the night was over soon after. I hobbled out to our truck and woke up this morning stiff and sore. Highway looked at me lovingly, asking with great concern, "Do you feel like riding still? You don't have to you know. It's up to you." I want to ride. I want to push past this and get out there and learn. I know it's something inside of me that stands in my own way, making this so much harder than it has to be. Failure, quitting, whining, and trying are unacceptable to me. Doing. I will do it and that's all there is to it. Once my fear relents to my determination, I won't stand in my own way anymore. Sash keep at it and eventually riding will become like breathing. Love that your biker's name is Katie Scarlet. It's funny because I named my bike Miss Scarlet when I got her a year ago. The 'trying' is part of the 'doing' and one day it will just come and you will realize that it happened without thinking. Maybe you need to focus on all the good things that you do when riding and it might take out some of the angst. I still have moments when I am not happy, but then I just ake it back to the basics and refocus. Hang in there, you've got the stuff it takes, just be patient.